Fugu Poker employ the strictest anti-hacking security standards so you can deposit and withdraw your money with absolute confidence. 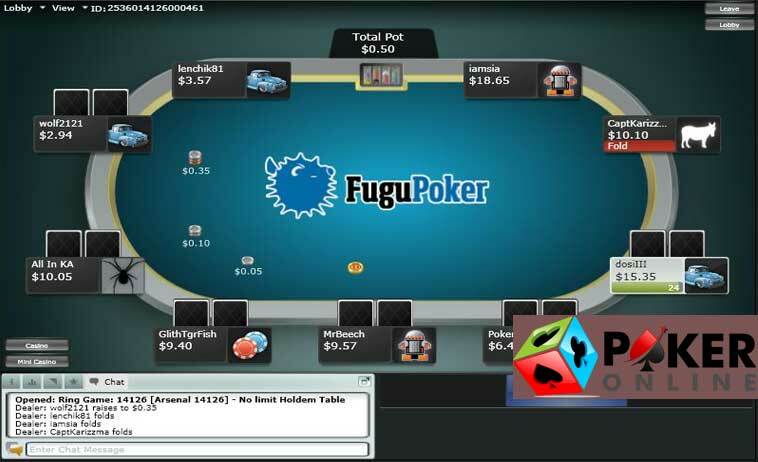 Fugu Poker, an online poker room on the Cake Network, is one of the newest arrivals into the online poker industry. The highlight of this online poker room is its unique rewards scheme, which challenges players to earn Gold Chips and Gold Cards in addition to Frequent Player Points (FPPs). Remember to use your Fugu Poker Bonus Code when signing upFugu Poker is a brand belonging to IP Holdings, which is licensed and regulated in Curacao. The company operates under Cyberluck, a leading provider of gaming licensing and hosting in Curacao. Fugu Poker welcomes newly registered players with a grand first depositor bonus of 110 percent up to $600. The online poker room also invites new players to take part in its New Depositor $500 Freeroll, which is run on Saturdays at 2:00 p.m. ET. If players win any money in this freeroll, Fugu Poker will credit the winnings directly to their online poker accounts. However, players need to collect at least two Gold Chips through real money play before they can request payout. Fugu Poker offers popular variants of online poker such as Texas Hold’em, Omaha Hi-Lo, Omaha, and others. Free poker is one of the most important features of Fugu Poker. Since the online poker room offers several fun poker tables, it is an ideal place for beginners to learn the rules of online poker and to implement its strategies. Players who wish to play for fun will receive 1000 chips, and whenever they fall short of chips, they only have to click on the dealer tray to receive fresh chips. Players do not even have to make an initial deposit in order to play free poker at Fugu Poker. Fugu Poker also runs cash games and tournaments 24/7, and the games are customized to suit almost all skill levels and bankroll sizes. In brief, Fugu Poker has something for all types of online poker players. 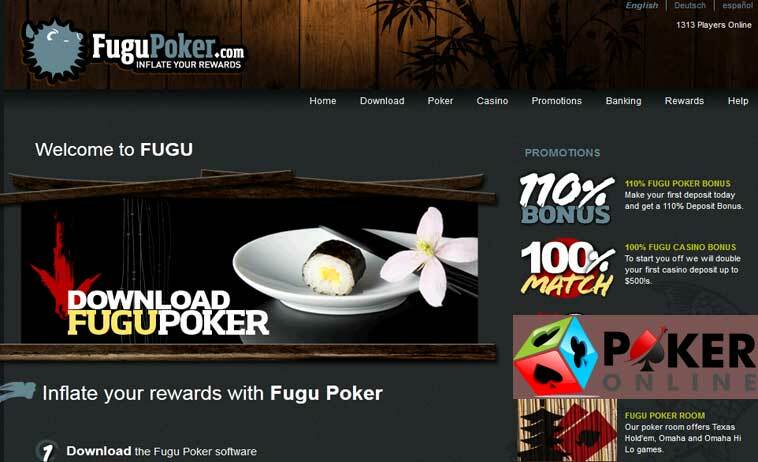 Fugu Poker is famous for its online poker tournaments, which are run 24 hours per day. Players can play almost all types of online poker tournaments, such as multi-table tournaments, Sit & Go’s, Heads-up tournaments, Re-buy tournaments, Add-on tournaments, freezeouts, shoot-outs, satellites, and freerolls. Fugu Poker players need not buy-in to tournaments with cash alone. They can use Gold Chips and Gold Cards earned through real money play to buy-in to the most lucrative Fugu Poker tournaments. Fugu Poker has one of the best rewards systems in the industry, comprising Gold Chips, Gold Cards, and Loyalty Levels. The online poker room rewards players with Frequent Player Points (FPPs) for playing real money poker. Based on the number of FPPs they collect, players will receive Gold Chips, which can be used to purchase poker merchandise or exchanged for real money. Fugu Poker also rewards players who take part in cash games and tournaments with Gold Cards, which can be used to buy-in to exclusive online poker tournaments. Players can also sell their Gold Cards to other players. The Rewards Program at Fugu Poker comprises several loyalty levels, which can be achieved by completing tiers, and players can complete tiers by collecting Gold Chips. Once players complete a tier, they will be rewarded with special benefits and bonuses. Needless to say, players need to make a deposit before they can play real money poker at Fugu Poker and win cash prizes. Making deposits and withdrawing money at Fugu Poker is easy, safe, and secure. Players can use a wide range of banking methods such as credit/debit cards, prepaid cards, and alternative payment methods (APMs) to fund their online poker accounts. A list of deposit methods available at Fugu Poker includes Visa, MasterCard, Diner’s Club International, Neteller, Skrill, Moneybookers, ClickandBuy, WebMoney, PayDirect, UKash, PaySafeCard, EcoCard, Direct Bank Transfer, Maestro, Visa Electron, POLi, and many others. Players can use deposit options such as Neteller, Skrill/Moneybookers, ClickandBuy, WebMoney, PayDirect, EcoCard, and Direct Bank Transfer to withdraw their winnings too. Fugu Poker does not charge players for using any of these payment processors; however, the payment processors might charge fees for their services. Fugu Poker has an excellent 24/7 customer support system with well-trained and friendly customer care representatives, who are eager to be of help players at any time of the day or night. Usually, the online poker room answers emails in just 20 minutes. The online poker room requests players to first check the Frequently Asked Questions (FAQ) section for answers to their queries, and if they still need assistance, they can email to support@fugupoker.com.